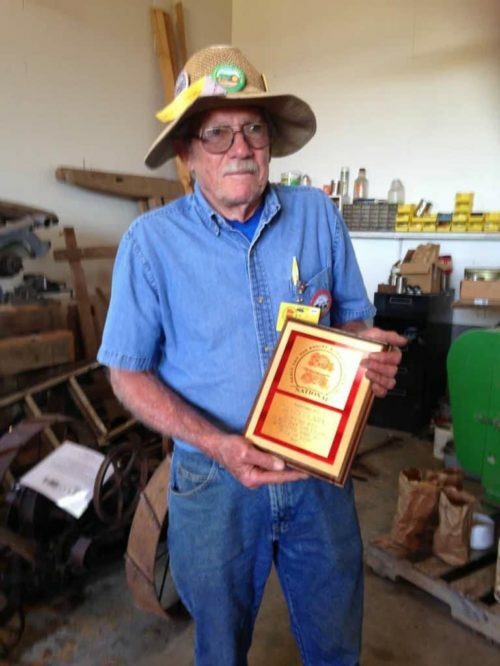 Dave has served as President of Ozarks Older Iron Club (OOIC). He is currently on the Board of Directors and has been for several years. This board is very active and meets monthly to discuss ideas that should be presented to the membership meetings of our Branch 28. Dave volunteers many hours to further the activities of Ozark Older Iron Club. We want to honor Dave for his tireless efforts to help further our branch activities. He always has a display of “hit and miss” engines, hand grain grinders and other items at our spring and fall shows. He also spends lots of time helping design and organize an ad book we have for visitors and members. This book also lists the activities and history of our club. Dave is also an integral part of the “Tuesday Work Crew” that keeps our grounds and buildings in good shape. This crew also reconditions and preserves the many tool and implements that have been donated to our grounds. Dave has his own collection of “hit and miss” engines, scale steam engines, and a Model A pickup. He displays these items at our shows and also other festivals in our area. He has returned a donated loom back to its working condition. He also helps keep our two steam traction engines in safe and working order. Dave also worked to organize and label several display cases of small tools and household items for the public to view inside our clubhouse. He has spent many hours researching info for lots of pieces of antique implements, etc. and made signs to put on these to inform visitors about the function and history of the items. He wants items back to original working order to better show the agricultural heritage of our area. Dave is an inspiration to all our members in the collection, preservation, and exhibition of antique equipment for both outdoor and indoor uses.